Blog Shower Repair What to Look for & how to STOP a leaking shower! What to Look for & how to STOP a leaking shower! Your shower repair options. Shower repair and leaking showers and the need for shower repair are growing more and more unavoidable due to the materials and methods used in modern day construction. Shower Repair if your need it do not ignore it! We list a few solutions which may help in your situation and not break the bank. Ignoring the signs of a leaking shower and the need for shower repair could cost thousands and cause long term building issues and defects. Shower leaks and water leaks from a bathroom or shower is the most annoying defects you will face as a homeowner. 90% of homeowners who call Epoxy Grout Pro start the conversation with my shower leaks! Do you do shower repair? Followed by why is my shower leaking? and where is my shower leak? Truth of the matter is, if your bathroom or shower was constructed or renovated on after the mid 1980’s, Your bathroom or shower waterproof membrane has failed. If your getting a leak or egress outside of the wet area and you need a repair. If your shower or bathroom was built before the 80’s, just like any other part of your home it requires maintenance and rejuvenation. A shower repair is designed to rejuvenate and repair a tired leaking shower or bathroom. Shower Leaking? Here’s How to Track it Down. If you see or suspect water is leaking from your shower, finding the cause can take some time. Learn how to find the leak source and save some cash. Saving cash means having some idea of what to look for before calling the plumber out who could cost you hundreds to be told you have a leaking shower base and you nee to get it resealed which brings you right back to this post. Could it be the shower plumbing? 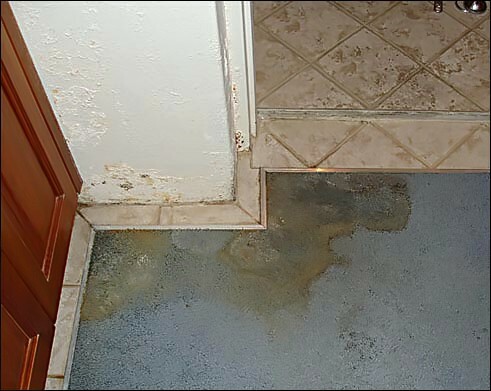 Have you woken to a leak or wet floor covering? Has the shower leak got considerably worse or bigger within hours or days? These are all signs of a constant leak which would indicate a possible plumbing leak or pipe leak. A quick test would be to go out to your water meter and see if it is turning over. Firstly ensure no taps or water is being used, or the washing machine or toilet cistern is not filling up.Turn off your water meter and open a lower tap in the home. A tap lower than the level of the bathroom. If on a second story, turn a tap on downstairs and drain the pipes. If on the ground floor look for a garden tap or perhaps even a bath tap to release the pressure and drain the pipes. Has the leak or water flow stopped? If it has, time to call your local plumber! 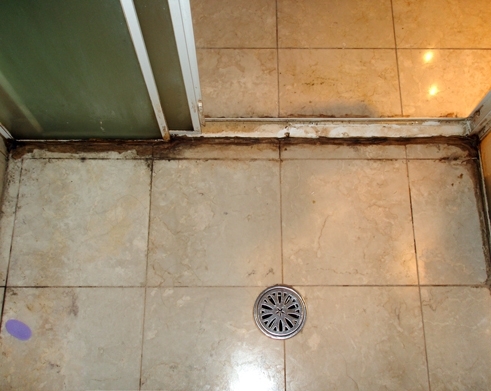 If the shower leak has not stopped it could be residual built up water within the bathroom or screed, under the bath. Could it be the shower floor? Secondly! 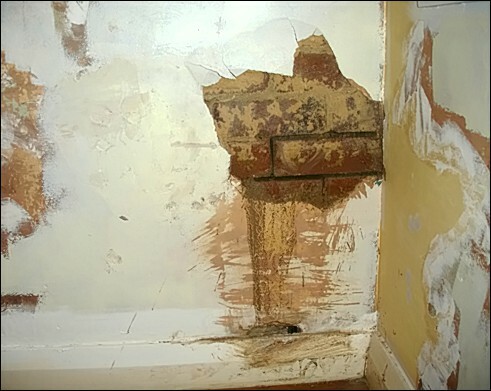 This would indicate a shower waterproofing membrane issue or failure. 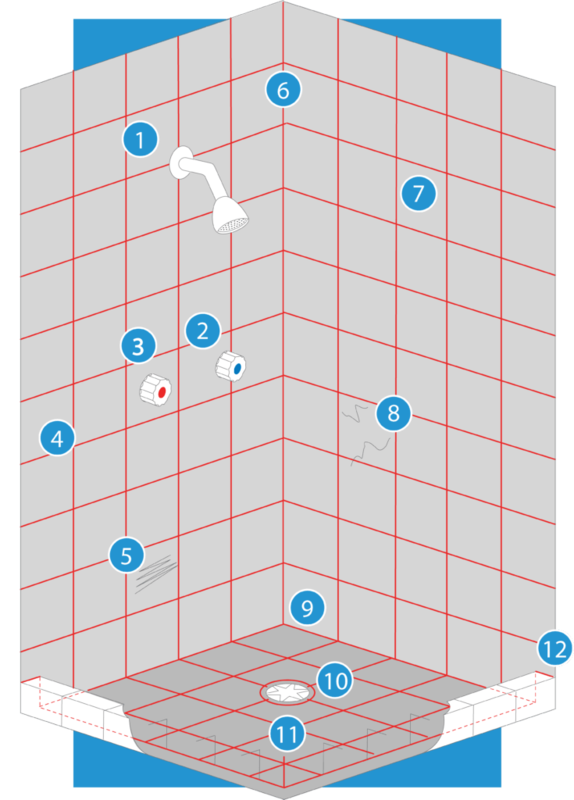 To test your shower, start at the bottom and work your way up to the shower head. You could do a dye test on the base of the shower by plugging or taping over the floor waste and from another sauce fill the shower base to a point where it does not overflow or go over the shower screen channel if you have a framed shower screen. TIP is since you do not have tracing dye at home, use food colouring. By using a dye and changing the water colour you can differentiate between old built up water and the dye coloured water. If your leakage is now the colour of the water in the floor of the shower, your have found the source, and can eliminate the call to the plumber, saving you hundreds you can now put towards your shower repair. If the leak does not change to the colour of the shower water you can eliminate the floor area as the source. 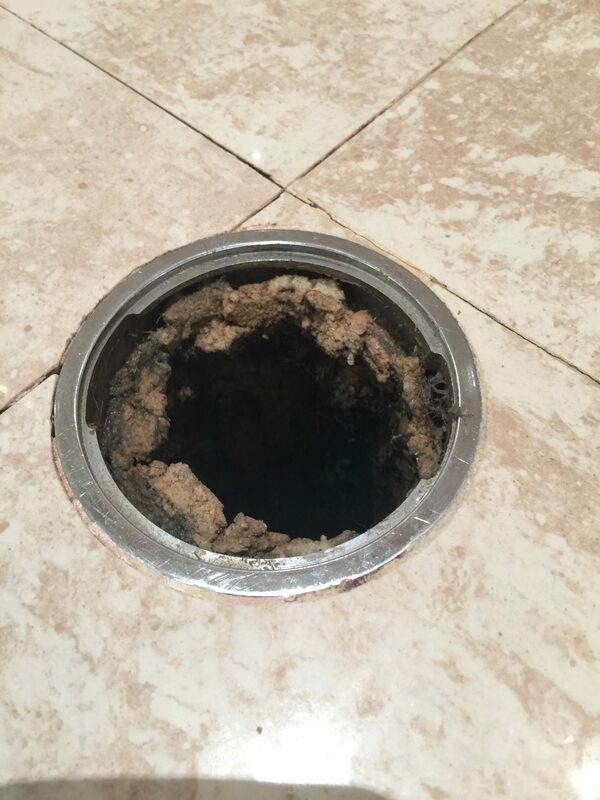 Could it be the shower drain? TIP remove the tape over or however you plugged the waste, double check again that your leaking water colour has not changed, if it has! Your waste pipe is not the suspect, call your plumber. If after some time the leak is still evident and still clear in colour, wet the walls down starting at the bottom and working your way up, looking and testing grout holes, missing grout, cracks, tap penetrations shower screen. You are now looking if the leak flow to increasing, getting considerable more and faster, even if not flowing, look for movement of particles or dust in the puddle or flow. This would indicate the source of the shower leak. TIP for more in depth testing procedures refer to: Diagnosing a leaking shower. Epoxy grout pro has several repair options and shower repair costs dependent on the age, condition and structure of your leaking shower. Repair costs range from $320.00 to $645.00. Shower floor sealing existing grout to stop leaks. Bare basic shower floor repair, replacing silicone to internal corners with epoxy grout, sealing floor waste internal and externally to prevent capillary action under the tiles. This is the $320.00 Bare basics Shower Leak Repair. Replace and regrout shower floor are and tiles to repair a leaking shower. This service replaces all the existing porous grout between your shower floor tile with impervious, 2 part epoxy. The floor waste is sealed internally and externally to prevent capillary action under the tiles. The shower screen is sealed internally over the new epoxy floor grout to prevent seepage and water tracking under the shower screen. Shower repair $400.00 Leaking Shower Floor Regrout Resealing using Epoxy Grout. Stop leak shower repair & full shower rejuvenation. Epoxy Grout Pro top shower repair service and backed by a LIFETIME warranty. LIFETIME refers to while ever your tiles remain bonded to the walls and/or floor. 1. Remove old silicone or grout from all internal junctions within the shower. 2. Remove existing wall grout to the required depth using our diamond burrs. 3. Remove existing floor grout to the required depth using our diamond burrs. 6. Clean and inspect internal of floor grate. 7. Remove existing silicone to internal of shower screen. 8. Grout the shower walls to height of shower screen with anti mould, water resistant polymer grout. 9. Grout floor tiles with 2 part epoxy grout to ensure no leaks. 10. Grout internal and external of floor grate. 11. Grout and seal internal wall and floor junctions with 2 part epoxy grout. 14. Seal behind tap flanges. All this within 2-3 hours and your shower is usable the next day. to book your shower repair today, call Trent Moreland of Epoxy Grout Pro on 0405148449.